CALL FOR PARTICIPATION HAS ENDED! THANK YOU FOR SUBMITTING! SAVE THE DATE FOR IUC 43! 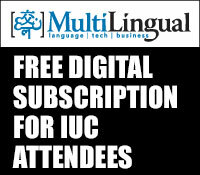 For over twenty-eight years the Internationalization & Unicode® Conference (IUC) has been the preeminent event highlighting the latest innovations and best practices of global and multilingual software providers. Join us in Santa Clara to contribute your ideas and experiences working with natural languages, multicultural user interfaces, producing and supporting multinational and multilingual products, linguistic algorithms, applying internationalization across mobile and social media platforms, or advancements in relevant standards. Join in with other industry leaders to present your ideas and solutions at the 43rd Internationalization & Unicode Conference (IUC 43) in Santa Clara, California, October 16-18, 2019. We look forward to seeing you there!